If you follow me on Twitter, you may have noticed my tweet last night about these amazing over-the-knee boots I found on Target.com. Yes, Target.com. 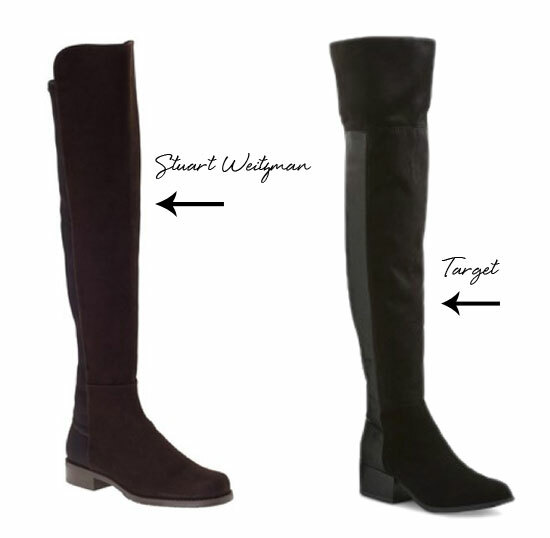 I fully admit to owning the Stuart Weitzman 50/50 boots and I do truly love them. However, I have to say that the way more affordable ones look pretty damn amazing. In fact, they're so amazing that I may have to get a pair as "back up". If there's one boot to have for fall, it's an over-the-knee pair. So, what are your thoughts? Spend or save? WOW! Those target boots are AMAZING! Thanks for sharing! Savesavesave....simply bc it's just so trendy. Spend the saved money on a more lasting boot. Great find! They look very similar!